Nam Nguyen performs his Free Skate at the 2019 Canadian Tire National Figure Skating Championships. 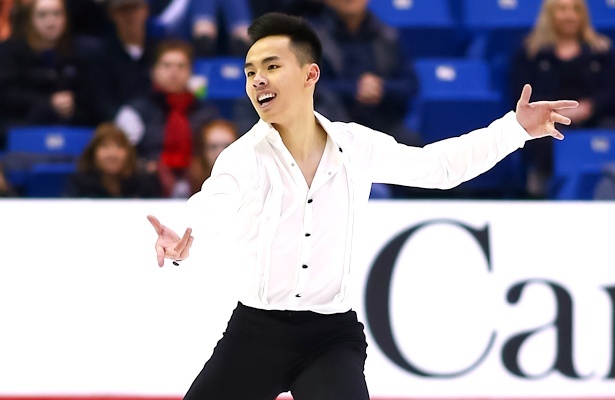 In the final event of the 2019 Canadian Tire National Figure Skating Championships, Nam Nguyen rose from third place after the short program to capture his second title. Stephen Gogolev, who was tenth last year, earned the silver, while defending silver medalist Keegan Messing slipped to third for the bronze. The story of Nguyen’s title-winning free skate was told in the first jump, but he was nervous heading into it. “My one thought before the first Sal was ‘don’t have any regrets for what you do,'” said the skater. The takeoff, in his own words, was shaky, as was the landing. “I was surprised to find myself on my feet, but then after that, it was more like ‘game mode’ and I just kept pushing, pushing, pushing all the way to the very end,” said Nguyen. In the end, he scored 172.28 points, for 258.01 and the gold medal overall. The 2015 Canadian Champion landed two quadruple Salchow jumps, as well two triple Axels. The first triple Axel, in combination with a triple toe loop (that was planned to have been attached to his first quad Salchow) was cited by the skater as an achievement he was especially proud of. Nguyen claims he finds the triple Axel-triple toe loop more difficult than a quad Salchow-triple toe loop. He earned two level 3s and a level 4 on his spins, and a level 2 on his step sequence. For Nguyen, his results this season have been proof positive. “When I invest everything that I have into this, no matter the result, I feel happy,” said the 20-year-old. He referred to an earlier conversation with the just-crowned ladies’ national champion, Alaine Chartrand, as they were “both in the same kind of stage” in their skating careers, with things now being “pretty awesome” for them both. Nguyen recalled first being introduced to the music from the soundtrack to La La Land shortly after its premiere by then-training partner Polina Edmunds. He rediscovered it after his disappointing results at the 2018 World Championships in Milan, and it soon made the natural transition onto the ice. A former World Junior Champion and skating prodigy, Nguyen was nevertheless quick to dismiss any suggestion that he saw himself in silver medalist Gogolev, who he referred to as “simply incredible” in the level of his technical content. Nguyen did preserve, for the time being at least, his status as the youngest ever Canadian senior men’s champion. Gogolev, in first place after the short program, came second in the free skate with a score of 164.79 points, for 253.56 points overall. His program began inauspiciously, popping a planned quadruple Lutz into a double, a moment that he cited as the cause of his disappointed reaction upon the completion of the free skate. He followed up that jump immediately with an excellent quadruple toe loop, subsequently referred to as his favorite jump of the performance, and then a quad Salchow-triple toe loop combination. Other than a very mildly negative Grade of Execution (GoE) on his triple Axel-triple toe loop combination, it was smooth sailing on the jumps thereafter. The 14-year-old received level 4s on his step sequence and two of his three spins; his change combination spin was a level 3, and he received a note for insufficient number of rotations on one position. Messing, who was in second place after the short program, but placed third in the free skate (160.26 points), for third place overall (247.44 points overall). Like Gogolev, he opened with a quad Lutz attempt, but ended up with only a messy triple, followed by a similarly rough landing on an attempted quad toe loop and a fall on his first triple Axel. After this unpromising start, Messing rallied, and landed his second quad toe loop in the bonus area for the first time that season. Other than another somewhat negative GoE on his second triple Axel (in combination this time), he ended his Charlie Chaplin-themed free skate strongly. Joseph Phan, who had finished a disappointing sixth in the short program after a fall on his opening quad toe loop and a brush with the boards on his combination, had a much better day on Saturday, finishing fifth in the free skate (153.72 points) and fourth overall (230.07 points). The 2016 Canadian Junior Champion opened his program with a quad toe loop-triple toe loop combination, and despite four underrotation calls, one of them on a somewhat awkwardly-landed triple loop, he had a strong result. Phan called it his best performance of the season, and praised new coach Brian Orser, who calmed him down after a poor warmup where Phan failed to land a single quad toe or triple Axel. He also singled out choreographer Jeffrey Buttle for his work in developing the free skate over the last season-and-a-half. In fifth place overall (224.15 points), slightly less than six points behind Phan, was Conrad Orzel, whose 141.28 free skate score was the sixth-highest of the day. Doubling his opening quad Salchow attempt, he succeeded with his quad toe loop, but later fell on an attempted triple Axel. The 18-year-old from Toronto was disappointed with himself, particularly for missing the quad Salchow that he has “a really good track record” with. “I just gave it away for no good reason,” he said, adding that he still hoped that his consistency through the season would earn him a berth at Junior Worlds. Nicolas Nadeau, seventh after the short program, moved up to sixth place overall (223.90 points) on the strength of his fourth-place free skate (153.74, 0.02 ahead of Phan). “It was an even better program than what I expected, but it had to compensate for the short,” he said. The 21-year-old enjoyed the “more mature” style of this year’s Depeche Mode free skate, which he feels has helped him develop as a performer. Skate Canada named Nguyen, Messing, and Nadeau for the upcoming Four Continents, while Nguyen and Messing were selected for the World Figure Skating Championships.